In summer 2018, the club is trialling a junior club session for different age groups under 18. Under 14s must be accompanied by an adult. Courts 3 and 4 are booked for the junior club session between 3-5pm on Thursdays during the summer holidays. To find out if it is on, join the Fishbourne Juniors WhatsApp group by texting 0787515119. 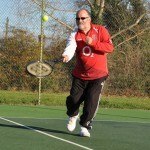 At any Fishbourne club session you can just turn up and get a game with whoever is there. It is a mix-in session for everyone, and arranged games are not permitted. 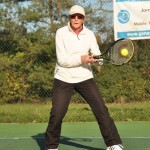 The emphasis is on mixed doubles to ensure everyone is included. There is no additional fee for these club sessions for adults or juniors, and tennis balls and floodlights are provided for members free of charge. 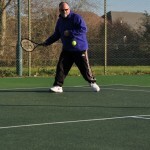 Remember only courts 2 and 3 are floodlit. Members may bring a guest to any of the five club sessions a week for a fee of £3 per session A MAXIMUM OF THREE TIMES A YEAR. Members’ guests can only play if there are no members waiting to play. Members can play with their guests for a flat fee of £3 per guest as many times as they like – outside club sessions. Anyone thinking of joining is welcome to take part in one of our club sessions if invited to do so by a member. Just come along and meet us . . .
We also hold 3 American Tournaments during the year whereby partners are chosen randomly, followed by a BBQ or indoor buffet. 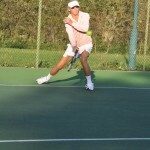 Our coaching partners, Generation Tennis, also organise junior tournaments during the year. 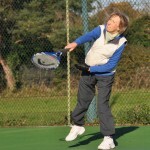 Our members also arrange occasional friendly matches against other local tennis clubs. At the end of our summer season we hold our annual dance and trophy presentation and on the Saturday before Christmas members are encouraged to take part in fancy dress tennis, followed by a buffet lunch. 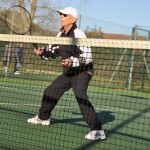 There is more to Fishbourne Tennis Club than tennis and we run a year-round social programme for the benefit of our members and their partners. We hold barbeques, an annual dinner/dance, play table tennis and this year tried our hand at the French classic, petanque. Details of our social events are placed on noticeboards in the club pavilion and can also be found on our website.